Hugo Slot is 10 paylines and 5 reels video slot game powered by Play’n Go software platform. This slot can be played with the use of coin sizes 0.01 to 2 per spin and it offers a jackpot of 2000 coins on your total bet. Minimum and maximum coins per line for the game range from 1 to 5. 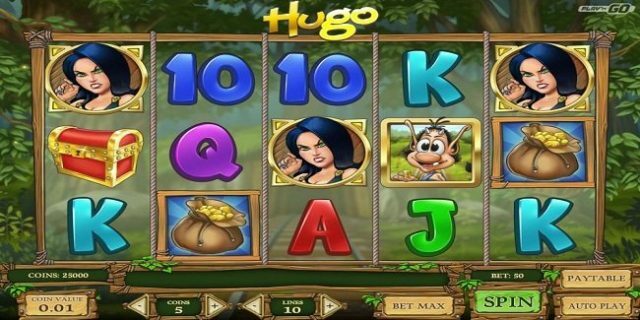 This slot is inspired by the friendly toll called Hugo. The features of this slot are very colorful and sound effect is awesome. The slot also contains incredible graphics and the reels of this game are being set against the woodland backdrop. “lines’ can be used to set the number of lines to bet on, “coin value” is used to set the coin size and “coin” can be used to set the number of coins per line. “Bet Max’, “auto Play” and “spin option” can be used to set the maximum bet, to set the reels in motion continuously without any interruption and to start the game respectively. This slot contains wild symbols, scatter symbols and the bonus symbol. The Hugo itself is the wild symbol which can substitute for all other symbols except the scatter and bonus symbols. The Evil Witch Afskylia is the scatter symbol in this game, whereas the Treasure chest is the bonus symbol. Free spin- you will trigger free spin feature once have landed on 3 or more of the scatter symbols on active paylines. Players will have t choose between 3 sets of free spins. The Evil Witch Afskylia will give you 5 free spins and 3x multiplier, whereas the Hugo will give you 10 free spins with x2 multiplier and the last option i.e. Don the Crocodile will give you 15 free spins with x1 multiplier.